Front and rear Shimano Ultegra derailleurs in 8,9 and 10 speeds, double and triple models for top level road use. 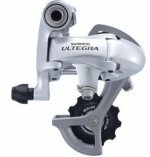 For example the 6600 Ultegra is a light and durable rear derailleur for top level road use. Advanced Wide Link design rear derailleur. Super stiff for fast and accurate changes across the cassette. Large 11 tooth pulleys increase service life and reduce noise. Sealed bearing tension is smooth and durable. Super light shift action. Ultegra finish. Compatible with 8-, 9-, and 10-speed drivetrains. Weight: 219 grams.